There are so many reasons to use lemon. I love these sweet, tart yellow citrus fruits. First of all, have you been searching for the perfect thing to add some zing to your juice recipes? Lemon will do the trick, and you can count on this exceptional fruit to add important nutrients to your juice along with amazing extra flavor. 1. Lemons are packed with essential nutrients. The reason we juice in the first place is to be able to take advantage of the vitamins, minerals, enzymes, fiber and other nutrients naturally present in fresh produce. In the case of lemon, those nutrients include substantial amounts of pantothenic acid (vitamin B5), pyridoxine (vitamin B6), folate (vitamin B9), vitamin C, calcium, copper, iron, potassium, fiber, and a substance called limonene (a beneficial phytochemical). Beta-carotene (which converts to vitamin A in the body), vitamin A, lutein, magnesium, phosphorus and zeaxanthin (a carotenoid antioxidant which, like lutein, is believed to promote healthy vision) are also present, although in smaller amounts. Among other things, lemons are a superb source of antioxidants, including but not limited to vitamin C. These substances help protect your body’s cells and tissues from the damaging effects of free radicals. If left unchecked, free radicals can cause the type of damage that research has found associated with several inflammatory diseases and cancers. Plus, several of lemon’s nutrients possess potent anti-inflammatory properties. Actually, the full list of lemon’s beneficial properties is very long, which is awesome. We haven’t even touched on the benefits of most of the vitamins, minerals and other nutrients in lemons. 2. Lemon’s tart, acidic flavor will add zest and zing to your juice. So important! I can't tell you how many times I use lemon to fix a recipe. This alone makes it one of the best reasons to use lemon in your juices. Lemon has the ability to add flavor to almost anything you eat or drink. Pure lemon juice is too tart to be palatable for most of us, but adding some lemon to your juice recipes just gives your juice some added zest and zing. That can be important if your motivation to juice every day is waning because the same old flavors are starting to get tiresome or boring. And let's not forget, lemons are inexpensive and widely available. Hardly anyone would consider lemons to be an exotic fruit, which means they’re cheaper than many of the options out there. Not only that, but you’ll be able to find them at virtually any store that sells fresh produce. Availability and price are important when you’re juicing every day. 3. Lemon juice has many health benefits. Let me list a few! There are many reasons to use lemon in your juice recipes. There are, however, a couple of things to watch out for. Lemon rind is high in oxalates. If you have kidney or gall bladder stones (or a family history of the same), remove the rind before adding lemon to your juice recipes. Oxalates can crystallize and create or worsen kidney and gall bladder stones. Naringin (one of the flavonoid compounds in lemon) may interfere with the body’s metabolism of some medications. 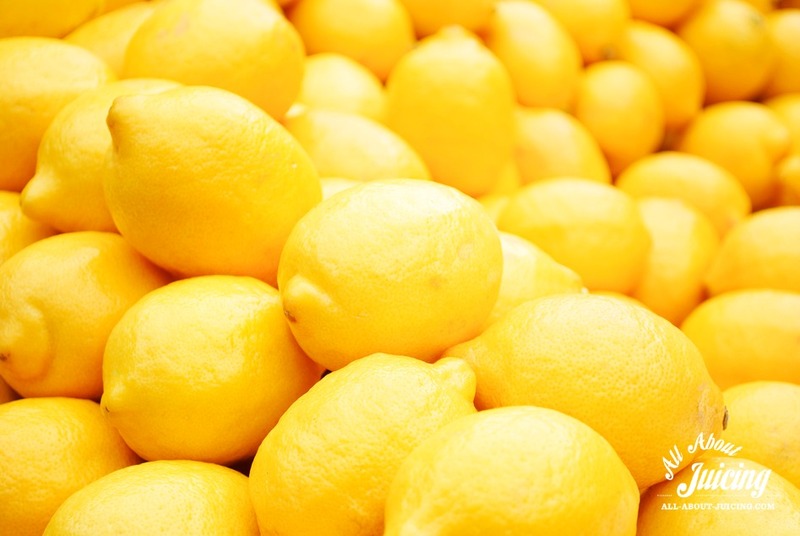 If you’re taking medication, check with your health care provider before adding lemon to your juice recipes. The naringin in lemon may halt or interfere with your body’s metabolism of certain medications. If this occurs, the medication could accumulate in your body instead of being metabolized normally. Depending on the medication, this, in turn, could create a risk of drug toxicity. Juicing: Start out by adding just half a lemon in your juice recipes. You can add the rind, but not too much. It's very strong. If you aren't a huge fan of the tart flavor, always leave the rind off. Lemons typically cover up the taste of greens and other produce you might not like. Mix it with ginger in your juices for even more of a taste cover-up, if needed. This is a good strategy when coming up with new green juices that might not otherwise taste great. If you want some ideas on how to use lemons in your juices, check out these citrus recipes. Blending: If you don't have a juicer and only a blender, always remove the rind. Adding a whole peeled lemon to a smoothie will not be as strong as when it's juiced with a juicer, so it's a great way to start. If you aren't sure you'll like a whole lemon, start with half a lemon. Morning beverage: If you rather not juice or blend, but would like the benefit of a lemon drink, try my Lemon Elixer. Mix the juice of one lemon and 1 tbsp of organic apple cider vinegar to a glass of water. Drink it in the morning before you consume anything else. It helps to get everything moving in your body and is a great way to start the day.